Online reviews and ratings of businesses on sites like Yelp, Facebook, Google, and TripAdvisor have the power to shape consumer behavior. In today's technology and data-driven age, consumers are eager to validate their purchase decisions, and seek to do so by using social media and real-time feedback from other consumers as their key resources. But how exactly are consumers using local search services and online review sites to find and assess businesses? What kind of impact do reviews and ratings have on their path to purchase? After examining in greater detail the research and decision-making process of today's consumers, customer feedback software company ReviewTrackers recently released the results of its first-ever Local Search and Online Reviews Survey. These visits then eventually translate into sales, with at least half of local searches eventually leading to a purchase for 57.7% of consumers. One of the most interesting aspects of local search is how it affects visitor traffic and revenue. Based on ReviewTrackers' research, local searches conducted by consumers often carry high purchase intent. Want to drive conversions? Work on improving local search rankings on Google. Also, develop a strategy for securing more (and better) reviews, optimizing your information on business listings across the web, and creating user experiences which inspire in-store visits and sales. As one might expect, consumers - equipped with, and empowered by, an expanding range of Internet devices - are fairly active in searching for specific types of information when assessing local businesses. 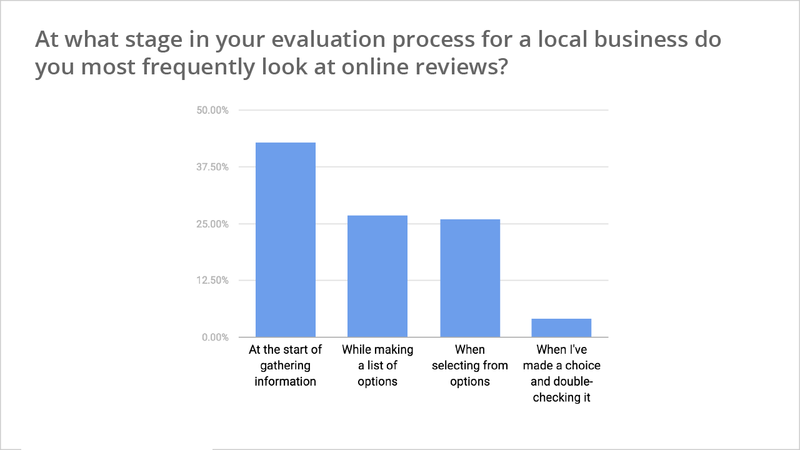 In fact, only a small percentage of survey respondents admitted to never looking for local business information like online reviews, location, hours, directions, and discounts. 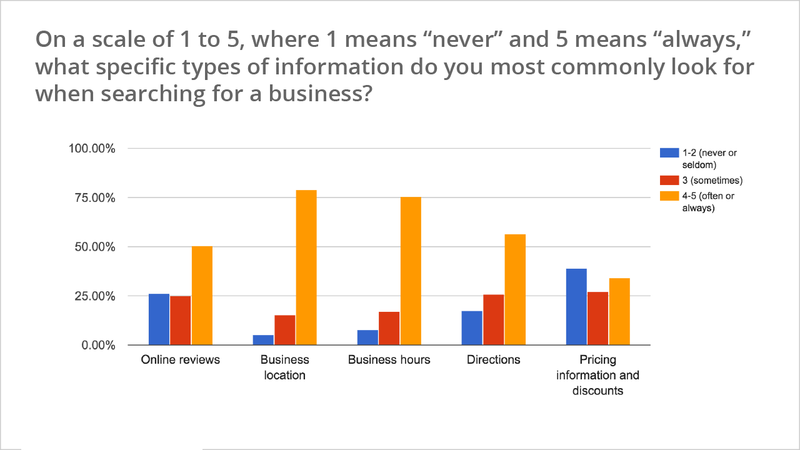 Based on the results, it seems that convenience plays a significant role in consumers' research and decision-making process, with location and hours ranking as the top two types of business information they look for. Interestingly, consumers are more active in trying to find online reviews than in hunting for discounts, with over 50% of consumers 'often or always' checking out online reviews, compared to the 34% that seek out information on discounts and pricing. Only 3% don't consider reviews when making a purchase decision with a local business. This reflects the vital shift in today's marketing landscape, where consumers, instead of marketers, are responsible for shaping the way a brand or business is perceived. 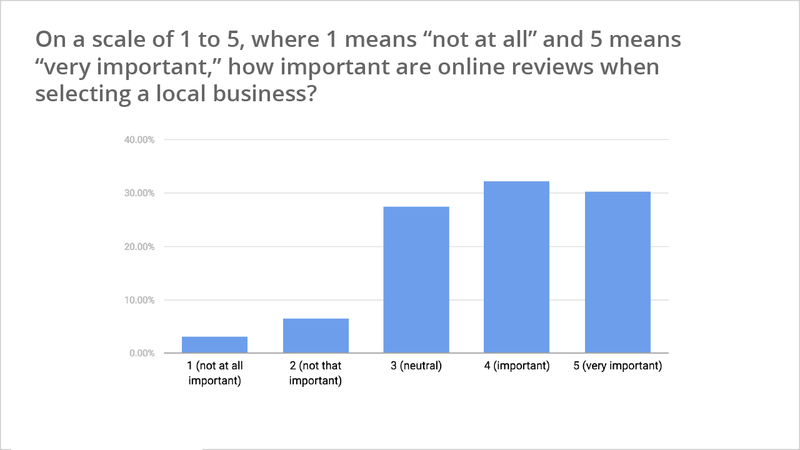 Ultimately, what customers say about your business in their online reviews - and how you respond to these reviews - can sway purchase decisions more so than can brand-driven marketing messages, paid advertising, and traditional customer acquisition efforts. By comparison, only 4.1% read reviews at the stage where they've already made an initial choice and are looking to double-check it. Reviews serve as useful resources for consumers at every stage of their journey, but they're particularly impactful in the early stages. These numbers reflect similar findings made by Social Media Link, which found that 83% of consumers discover businesses every month through peer-to-peer reviews. Indeed, along with local search results, reviews are an important peer-to-peer contribution to trust, helping shape the first impressions that consumers have of a business. As a foremost source of information, reviews are particularly useful at helping consumers discover new products and services through local search. 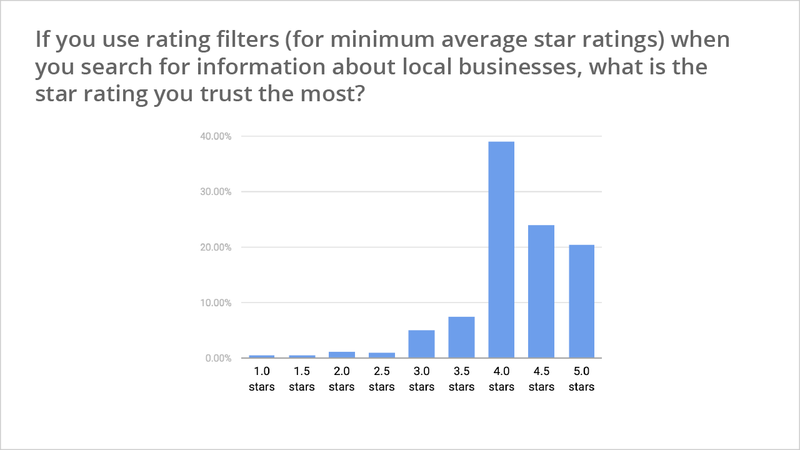 Only 2.5% trust businesses with overall ratings of 2.0 stars or less. Star ratings matter, and according to survey results, the ideal rating for purchase probability is 4.0 stars out of 5, followed by 4.5 stars out of 5. It's worth noting that today's consumers often perceive ratings closer to a perfect 5.0 as too good to be true, and they appreciate less-than-perfect reviews and ratings as an important element in their research and decision-making process. While your business should continue to shoot for perfection, you must also recognize that consumers specifically seek trustworthy, authentic - and therefore often imperfect - reviews and ratings. It's critical that you're able to resist the temptation to delete, ignore, or censor negative feedback, critical reviews, and low ratings. The continued growth of online reviews has led to a shift in consumers' purchase behavior, from the way they search for local businesses to the way to make purchase decisions. 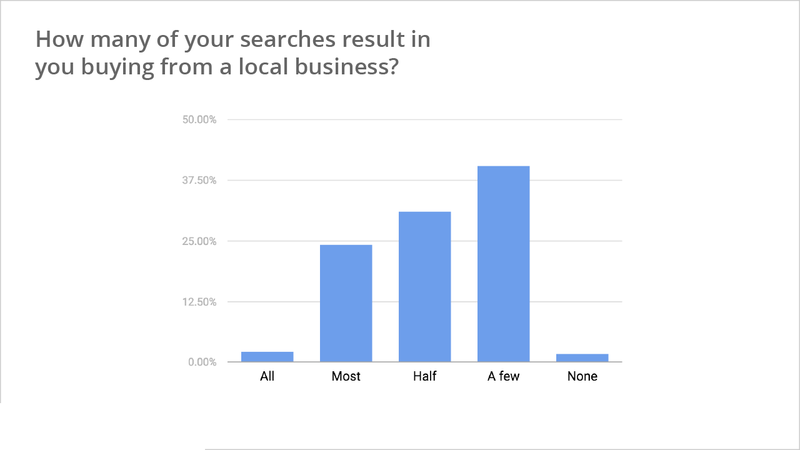 In particular, the impact of reviews on local search performance, online reputation, and ultimately revenue is undeniable. By embracing and leveraging reviews, your business can drive customers to your door and build your reputation and search visibility in ways that will make a positive impact on your bottom line.